NAI Ohio River Corridor’s Laurie Stanbro has the opportunity to market what is known as one of the world’s most “unusual”, “bizarre” or “coolest” buildings in the United States, depending upon your perspective. Built in 1997 as the headquarters of the Longaberger Company, this iconic building is listed in the Lonely Planets book “Amazing Architecture: A Spotter's Guide” as one of the 120 world’s greatest human constructions. The architecture of the building shaped as the company’s biggest seller, “Medium Market Basket” distinguishes itself from all the other bricks and glass structures that lack architecture originality. 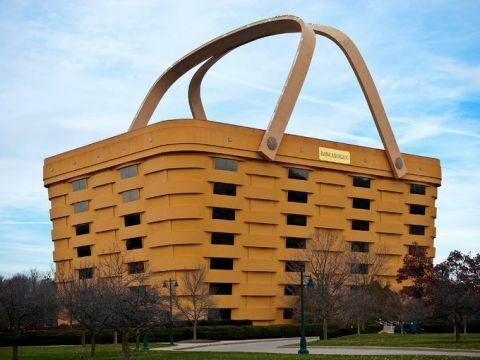 Located in Newark, Ohio, visible from SR16, the seven-story, 180,000 sqft basket stands proudly on 21.5 acres. Built at a cost of $32 million ($177.77/SF) this building has everything including impressive C-suite offices, conference rooms, cafe, theatre and fitness center. Natural sunlight floods the 30,000 SF atrium from the massive skylight seven stories high. Stanbro is marketing the building throughout the Midwest region. Utilizing the NAI Global, SIOR and CCIM network of offices and agents as well as regional and state economic development agencies, the building is getting exposure domestically and internationally. Organizations searching for headquarters, additional office space or investors looking for an opportunity to acquire one of the most unique and iconic buildings recognized worldwide have expressed interest in this facility. The building also offers a great opportunity to repurpose as a hotel, senior living or shared office concept. The uniqueness and the amenities of this building would appeal to start-up or existing businesses. The building has classic offices and open work environments that millennial and seasoned employees appreciate. The sale price of the building is currently undisclosed. Replacement value of an office building built to the high standards of this Class A interior finish would cost over $200/SF. Sales of existing buildings throughout the region are in the $100 plus/SF price range. The current owners are open to any serious offers either to purchase or lease the property. NAI Ohio River Corridor (NAIORC), a full-service commercial real estate firm, affiliate of NAI Global, consists of Stanbro, Leon McCombs and Bryce Custer, SIOR, CCIM and focuses on commercial real estate in eastern and southeastern Ohio. NAIORC works with buyers and sellers of industrial, office, and retail properties, and has been working with owners and buyers in the Shale Crescent, Point Pleasant, Utica and Marcellus Shale regions of the Tri-State area. NAIORC has offices in Bolivar and Marietta, Ohio and Weirton, WV.